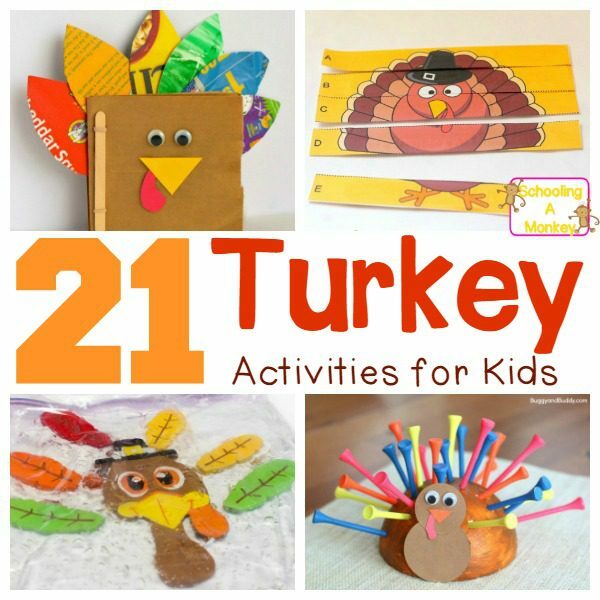 If you love Thanksgiving and cranberries, don’t miss this fun way to celebrate with Thanksgiving science! 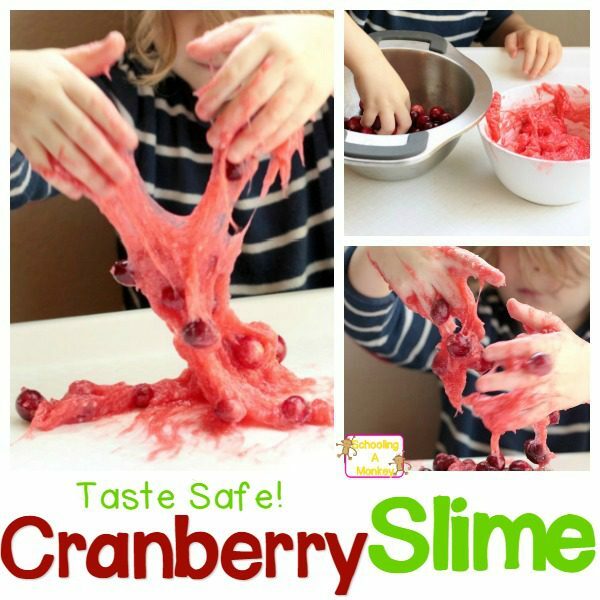 Taste-safe cranberry slime is awesome! 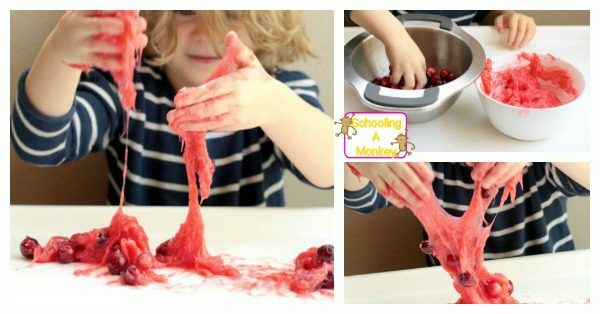 It’s one of our favorite slime recipes! Every year, I love making cranberry sauce from scratch. We buy the berries raw and cook them ourselves. With cornstarch and a bit of sugar and orange juice, the cranberry sauce is one of the things I look forward to the most about Thanksgiving. Our cranberry sauce tends to have a consistency that is similar to slime. When I saw the cranberries go on sale early this year, I knew I had to make cranberry slime! This Thanksgiving science experiment was fun for the kids and for me, and it tasted pretty similar to the real thing, too. This recipe is similar to regular cranberry sauce, but the berries aren’t cooked. Also, if you eat a lot of this, you might get stomach cramps or other digestive problems. Xanthan gum is known for its ability to cause stomach upset if eaten in large quantities. That is why this is a taste-safe slime, not an entirely edible slime. Also note, this is a messy slime. If you want a slime that isn’t sticky, try our frozen-inspired slime or Grinch-inspired slime. Mix 1 cup of water, 1/2 a cup of sugar, and the juice from one orange in a pot on the stove. Heat until the mixture starts to boil and the sugar dissolves. Remove from heat. Add a few drops of red food coloring and a tablespoon of xanthan gum. Mix together with a hand mixer or an immersion blender. If you don’t, the slime will be lumpy and not quite as slime-like. It will look more like jello if you don’t mix it up. 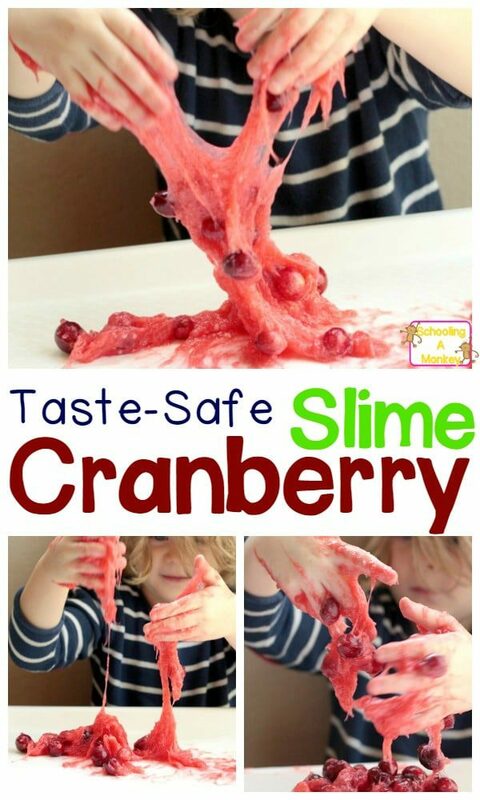 Add the cranberries to your slime. We started out with a handful, then the girls wanted to add more, so we did. Place the slime on a play-safe surface (we have this large tray and love it for this kind of thing), and let your kids go wild! You will also want to make sure this stays in the kitchen or on another hard floor as it is a bit of a nightmare to clean out of the carpet.